A retail bust… Soros schadenfreude… The 5 urged to “get on board with supporting your president”… and more! We’ll discuss the getting-money-out-of-China angle next week. Today, though, we’ll take up Trump — who Jim says is, in fact, a known quantity when it comes to China. And the pressure could start ratcheting up the moment Trump is sworn in, a week from today. There’s every chance he’ll immediately brand China a “currency manipulator” — a step that was always a bridge too far for Obama. Such a move would instantly throw global markets into turmoil. To help you prepare — and to parlay that turmoil into big short-term gains of 200% or better — Jim is hosting a live online briefing next Wednesday at 7:00 p.m. EST. He’ll clue you into everything you need to know before Inauguration Day next Friday. Access to this event is free; you can RSVP at this link. As long as Jim brought it up, that “worst-case” scenario is more likely now than it was 48 hours ago. This summer, we’ll be keeping a close eye on Talisman Saber — a joint military exercise between the United States and Australia that occurs during odd-numbered years. The last one in 2015 was, by some accounts, the biggest military exercise staged by the United States since the Cold War. 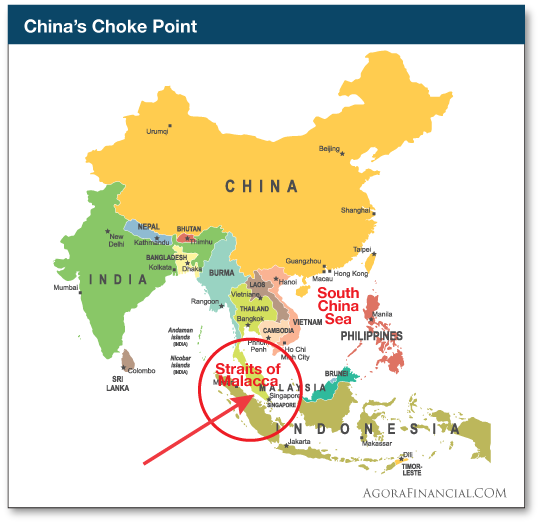 American ships and long-range bombers rehearsed a blockade in the Straits of Malacca, one of the great “choke points” in global shipping. Without access to the Straits of Malacca, China’s access to oil and other raw materials from the Middle East and Africa would become much more limited. Chinese leaders watched Talisman Saber 2015 with alarm… and began to accelerate construction of those artificial islands in the South China Sea. Now Mr. Tillerson proposes to blockade the islands, although he didn’t say how. Reminder: In 1940–41, Washington was determined to cut off the sea lanes that gave Japan access to oil and other raw materials. Fearing the loss of that access, Japanese leaders resorted to a desperation measure. They figured the odds of long-term success were low but they had no other choice. They attacked Pearl Harbor. To the markets… where the safety trade is off for the moment. The Dow is up a tad, back above 19,900… and small caps are up much stronger. Treasury yields are backing up, the 10-year at 2.42%. Gold is backing down to $1,195. The dollar index is stabilizing at 101.3. Among the items on traders’ radars today…. “The sky is not falling for development-stage biotech,” assures Ray Blanco on the science-and-wealth beat. As noted here yesterday, Trump hit out at Big Pharma during his press conference this week, suggesting that Medicare start negotiating bulk discounts with drugmakers. The Nasdaq Biotech Index took an instant 3.6% hit on Wednesday. But for the companies Ray follows, it’s largely irrelevant: “We are all about innovative new drugs. And these new drugs will command premium prices even if Medicare is allowed to negotiate pricing. 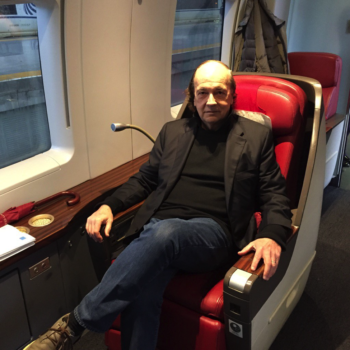 “I have been a member for some time now,” says an entry in our mailbag, “and I have found most of your information valuable and interesting when it relates to the markets, new technologies and Jim Rickards’ thoughts. “I must admit that over the past six months, I have stopped looking forward to The 5 and stopped reading The 5. I am not interested in your personal feelings about President-elect Trump and your continual assault on him. Your attempt on Wednesday give some credibility to the BuzzFeed fake story about Trump is ridiculous. You should have written that the story was fake, as it has been proven, and stomped on BuzzFeed and CNN for publishing it. Instead, you continue with the rumors because of your own personal bias against Trump. “You have made The 5 min. Forecast a crusade against Trump! I did not subscribe to this subscription to read about your issues with him. I will not be renewing my subscription to Technology Profits Confidential. Soon you will realize that your business model will suffer. The 5: OK, we relent. All those Goldman Sachs appointees, including the two new ones yesterday? We’re sure they have only your best interests at heart. Seriously, are you trying to troll us from the opposite side of the “Manchurian candidate” reader who wrote in on Monday? In case you’re not… did you even read our reply to yesterday’s complainer? If you could see past your own leader-worship, you’d know from our musings since September we’re darn near certain it’s the latter. To say nothing of a concerted effort by the Intelligence Community to undermine Trump. But no, we will not “get on board with supporting our president.” In the best spirit of the Founders, we will never cease to be suspicious of, and vigilant against, all who presume to exercise power over our economic and financial lives. That’s not a matter of “personal feelings” against any one politician; it’s a matter of financial survival in the face of all politicians… and in the face of Washington and Wall Street realities. P.S. We’re back as usual tomorrow with our Saturday wrap-up, 5 Things You Need to Know… but we’ll be away on Monday while the markets are closed for Martin Luther King Jr. Day. The weekday edition of The 5 returns on Tuesday.